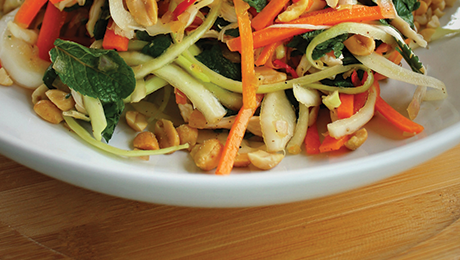 This salad combines some basic ingredients found in every home with a bit of Vietnam flair. Peel and coarsely chop the shallots, add them to a large mortar and pestle along with chopped chilli and the sugar and black pepper. Grind it until soft and liquid is dispersed. Transfer this mix to a large bowl and stir in the rice vinegar and fish sauce. Set to one side. Brush the chicken fillet with oil and season with salt and pepper. Grill it under a medium/high heat for about 6-8 mins either side making sure it is cooked through. Allow to cool then shred with your fingers finding the natural grain. Finely shred the cabbage and chop the carrot into fine matchsticks, take your time. Add these to the vinegar mix, toss thoroughly then add the chicken, mint leaves, coriander leaves, toss like you would a normal salad until combined and top with a scatter of roughly chopped peanuts.